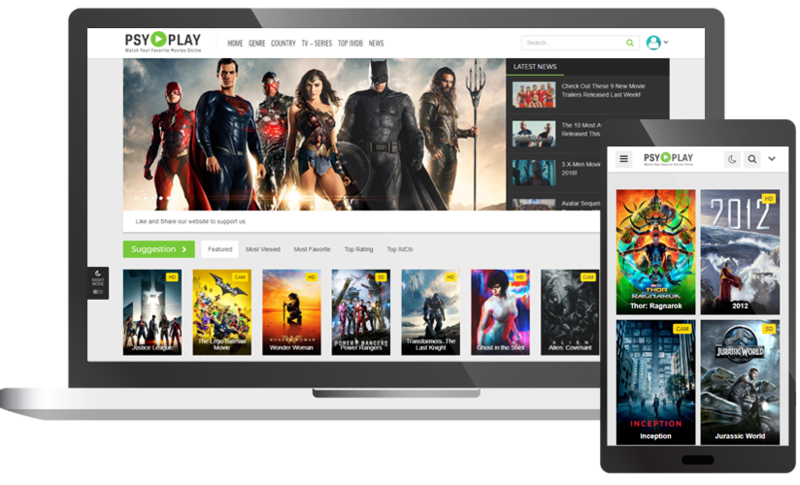 PsyPlay is one of the best wordpress theme for movies and tv-series content. PsyPlay wordpress theme is based on the design of the popular site 123movies. It has a powerful tool that will help you generate and complete almost all the necessary contents needed with just a click. Get lots of content from secure and reliable sources with just a single click. Get full control of your website and theme without modifying the code. Our themes is compatible and can be adapt to almost any screen resolution. Our themes can be translated into any language with My WP Translate or Loco Translate. Our themes are completely adapted to seo and compatible with any SEO plugin. Minimified html/css/js output specifically made to increase your site's loading speed. All theme licenses are guaranteed to not expire and can be use for lifetime. Constant updates to improve the functions and performance of our themes. Documents, guides and tutorials exclusively availble for verified customers. Automatic and secured payment gateway powered by PayPal. Get punctual and direct help from our support team on our support forums or email. Use our vouchers or coupons and get discounted prices with additional site activations. Verified customers can upgrade their license anytime and get a much bigger discount. Access to our private support forums strictly available for verified customers only. Have a question or needed help? Feel free to Contact us! © 2019 PsyThemes. Some Rights Reserved. Enter valid e-mail during your registration. An activation link will be sent to you by email. Login your account to be able to download or purchase our themes.